I miss this little speedster. I always liked Gardner, but sometimes I didn’t let it show. When Melky was sent to Triple A and Gardner took over, I hated him. When the stupid decision was made to make Gardner the starting centerfielder in ’09 instead of Melky, I hated him. See, I never really hated him even though I said I did. I just didn’t want him to push Melky aside. If Gardner and Melky could have played together, that would have been great. 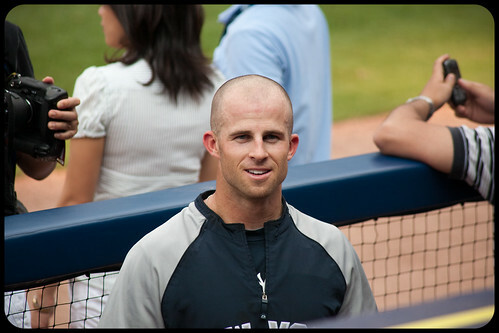 People think I am crazy, but I am convinced that this is true: I saw Brett Gardner in Fishkill. It was the Monday of the All-Star break, July 13th. My mother and I were coming back home after a nice shopping spree at JC Penney. In front of us in the lane to the left, I saw an extremely fancy car. It was a blue BMW convertible. It was the fanciest car I have ever seen in my life. I thought, “Who is driving THAT? !” The light turned red, and we stopped. We managed to stop right next to the car. I looked at the driver. I saw a guy with a funny-shaped bald head, wearing sunglasses, and chewing gum. My mouth dropped and I was speechless. IT WAS BRETT GARDNER!!! Who else looks like him? What are the chances that another man with a funny-shaped bald head, with enough money to have an expensive car, would be in New York during the All-Star break! THERE ARE NO CHANCES! IT WAS HIM! 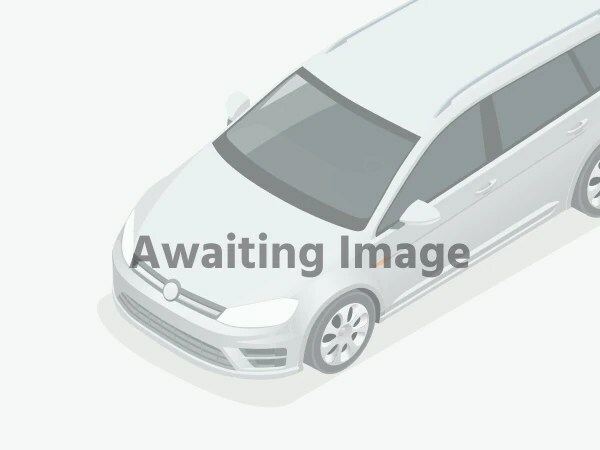 Brett’s car looked like this one. “NOO! BUT…HE’S GETTING AWAY!” I exclaimed in despair. I really could have killed myself. I was so close to a Yankee, and I blew it. My disbelief got the better of me. -Sigh-………..
…and Nick Stokes from CSI!!!!!!! Brett, I have been through a lot with you. I love you, I hate you, I love you, I hate you, COME BACK BRETT!!! NO! TURN AROUND!, I love you. The truth is, I miss you a lot. I don’t know what is going to happen with you in 2010, but I hope it is good. Enjoy the offseason. I can’t wait to see you next year! I’ve been missing my boys so much that I haven’t blogged about what the team is doing! I’m sure everyone knows anyway. We got Granderson, Johnson, and Vazquez. 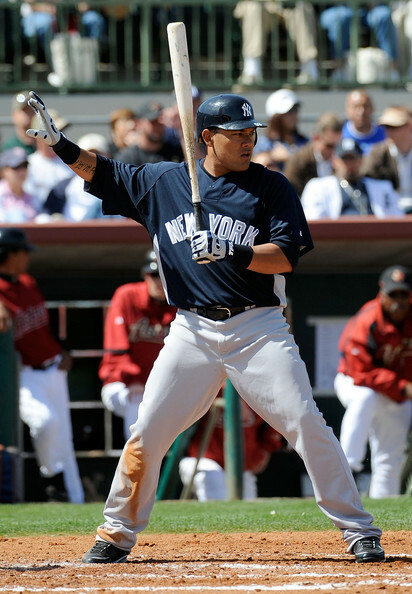 I think everyone also knows that Melky Cabrera was my baby and was my favorite Yankee. So you can imagine what this whole Javier thing did to me. But maybe, you can’t. It was a normal boring Tuesday at school. I had just come out of history class and entered the halls on my way to English. I hear a man call my name, and turn around to see who it was. It was Mr. Ogden! My history teacher from last year, the GUY THAT LOOKS EXACTLY LIKE BRIAN BRUNEY!!! He knows all about me and my Yankee devotion. And he knows of my infatuation with Melky. Ogden quickly broke the news to me. I went to my locker and hid my head behind its door so no one would see if I cried a bit. Ogden’s words kept replaying in my head. “Yankees traded Melky.” How could this happen? I thought he was safe now. I was in sixth grade. 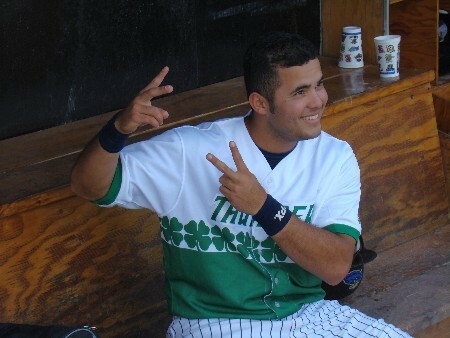 Javier Vazquez became a Yankee. I didn’t know anything about him…well,…I had his baseball card from when he was with the Expos. I used to stare at that baseball card for God knows how long. I always thought Javy was adorable, but now I could actually see him play! I was happy, to say the least, about this deal. Javier Vazquez was my first crush. Isn’t that cute? Every time he pitched, my eyes didn’t leave the screen for a second. I felt like I was in Heaven looking at him. But this paradise was cut short. Just look at him!. Friggin’ adorable! This picture just makes me want to hug him. 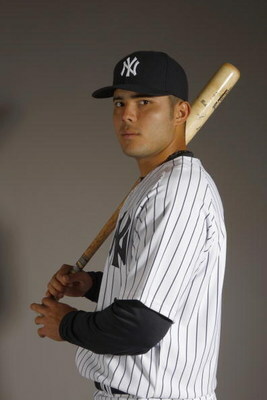 After ’04, the Yankees traded Javier away, without even consulting me (lol). They had no clue what they just did to me. I was young, about 10 or 11, and I was in love with Javier. AND THEY TOOK HIM AWAY FROM ME. I felt lost. I felt cheated. I felt cut-short; my one year with Javy was not enough. But there was nothing I could do. Javier was gone, and I was forced to move on. How terrible is that? A little girl, forced to get over her first crush. It was hard, but I began to leave Javier behind. He left me in ’04, and in ’05, a new cutie came upon the scene. Do you know who this cutie was? Melky. Melky showed his pudgy little face for a short time in 2005, and I loved him immediately. He was such a nervous little rookie! 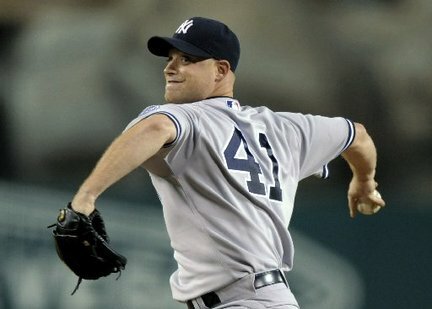 In 2005, I had a new favorite Yankee; a new Yankee I loved. Melky Cabrera was this man. And he remained so for 5 years. This pic just sums up Melky: Carefree, silly, and on base. I luv him. Naturally, I was devistated when I heard Melky left. But when I found out Javier was swapped with him, I was happily shocked. This trade was the most bittersweet thing that ever happened to me. I was torn. I lost my sweet Yankee love, for my great love of the past. What is this girl to do? How is this girl to feel? This whole story sounds like something out of a movie or something. This whole thing is 100% true. I still can’t really believe it. I won’t be seeing Melky again any time soon. No more dancing with Cano and Swisher. No more jumping high five after a win. No more silly, ridiculous things that only Melky can do. But…staring at Javier just might make up for this. If anyone has any advice on how I should feel about this, please comment. You can imagine how torn I must feel.